Rona’s Beads Aboard boat shop open for business. 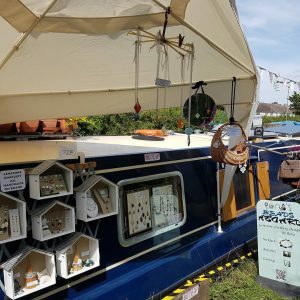 We had a lovely market at Fenny Stratford on the 4th and 5th August with lots of trade boats, I think 25 in total. There were a lot of interesting crafts to choose along with a cheese boat, ice cream and coffee boat, and two boats selling beers, wine and cider. We all enjoyed a sing-song in the evening. At the moment we are spending some quiet time dealing with our ‘to do list’ which never seems to get shorter! Our next market is at Milton Keynes for the August Bank Holiday weekend. Do come along for a visit, I’ll have all my gemstone jewellery on display, anklets, necklaces, earrings and bracelets.